An article by Emma Mas-Jones published in MultiLingual Magazine January/February 2016 Issue. It’s no secret that technology is driving the way we communicate, how we connect to one another and the way we conduct business. Just as the translation industry has been disrupted by advances in technical tools as well as web and cloud technologies, the interpretation sector has experienced its fair share of technology advances, innovations and has evolved with the increasing demands of the ever connected world. Our expectations have changed; the experience is everything. We are surrounded by smart, multi-function devices, and we expect to receive service everywhere at any time. What changes have been brought to the landscape of interpreting technology to respond to these new expectations? 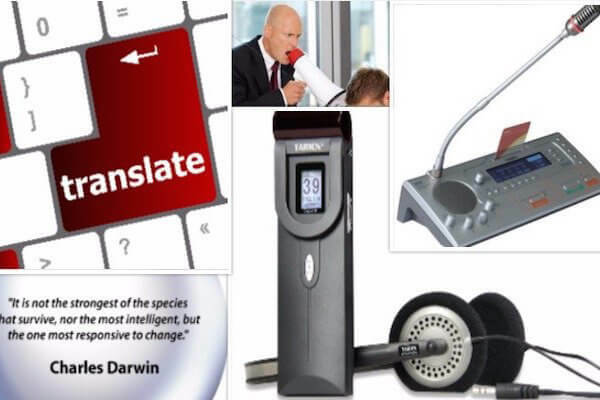 Industry leaders in simultaneous interpretation practice have made strides in three key areas: the design of high-efficiency and multi-functional solutions adaptable to various event settings; interpretation delivered straight to mobile devices; and, remote interpreting for an increased globalized workplace. This article will provide an overview of these latest developments and an emerging future technology. In conventional simultaneous or conference interpreting settings, the use of specialized equipment at the conference locations is required including soundproof booths, interpreter consoles, wireless receivers and other devices with technical monitoring by a technician during the meeting. The technologies available to distribute audio interpretation to the audience are radio frequency (RF) which is FM based and infrared (IR) technology which transmits audio through light. Digital Infrared technology is currently the gold-standard for high-profile meetings and most advanced technology as it provides secure communication and superior sound quality free from interference from wireless devices such as mobiles, microphones, etc and lighting systems. RF technology main drawbacks are security and interference concerns, yet count with the advantages of ease of installation and portability making them an excellent choice for tour guide and tradeshow type of settings. The leading conference and interpretation systems manufacturers have made a point to add new features in order to ensure increased reliability, flexibility and ease-of-use for interpreters and meeting participants. In 2015, at least two manufacturers have released new interpreter consoles to enable perfect ergonomics, hearing protection, advanced information display, and unique options for working with video devices responding directly to interpreters’ demands. The ability to connect third-party video display screens directly to the interpretation system is now a possibility making it easier for conference organizers to setup video distribution to the booths. On the TAIDEN interpreter console, it is even possible to select the video channel input, so interpreters can select the visual content that is most useful (whether cameras in the room or presentation materials). In this connected world, devices communicate seamlessly, simply, and instantly. A few new features to be noted: the ability for interpreters to connect their own IOS or Android devices to the interpretation system for sending messages to other interpreters. Interpreters also have an option to see the number of listeners or if they are being recorded or streamed. E Ink electronic nameplate are being used to display the working language of the booth automatically as interpreters come in and setup up their unit; a useful tool for room and booth signage. Multifunction devices that combine microphone with integrated interpretation and voting features are a popular choice with conference organizers as they provide convenience as well as a minimalist, organized and elegant event space. All these features combined provide increased comfort for interpreters, more flexibility for conference organizers, and a high-value experience for all attendees. Talking of multi-functionality, what can your mobile device not do these days? It’s your go-to tool for banking, transportation, entertainment, dating, and occasionally, you may even make a call. Applications continue to flood the market to cater for more than you could ever possibly imagine and have now made its way into the world of conference interpreting. In light of the growing trend of consumerised mobility dubbed Bring Your Own Device (BYOD), an application has been developed to deliver interpretation to conference attendees directly to their mobile devices, effectively using it as a receiver. The idea is that all conventional conferencing interpretation setting is present with interpreters sitting in soundproof booths listening to the speakers and speaking into the interpreters’ consoles. The main difference is that attendees listen to the interpretation through their own mobile device by downloading an application which streams audio via a Wi-Fi connection. The system is operated with a combination of hardware and software including a computer, converter, a router, a wireless access portal to enable the audio feed to the application in addition to interpreters’ booths and consoles. The software portal is also an advertising and announcement platform with push notifications which the event organizers can benefit from. There are clear advantages to this technology, in particular for event organizers, as it bypasses the need to rent or procure receivers and headphones and the distribution and collection of the devices at the venue resulting in cost-savings and convenience. All disruptive technologies, however, come with challenges and BYOD is no exception. As with web conferencing systems, this solution relies on high-speed bandwidth; any slowness in connectivity translates into the interpretation audio feed being lost and inconsistent sound quality. A major challenge common with other BYOD services is that of security. Meetings of a sensitive nature requiring high privacy may have concerns regarding the transmission of the contents of the meeting over Wi-Fi, its recording or disclosure. On the other hand, the user may have sensitive personal or business data stored on his device and be reluctant or even prohibited by company policy to download such app or use an untrusted connection to protect against unauthorized or unlawful access. Further, on a practical level, technical support by onsite technicians may not be possible due to liability reasons and, as with any mobile application, the battery life of the device may be quickly depleted with continued use. And then there is the most basic issues yet equally preventive of interpretation taking place - participants may not own a smartphone or tablet; there is no guarantee that they won’t forget to bring the device, headphones or charger (if applicable); or they may simply not have sufficient space to download another application. Meetings and conferences in which interpretation is critical, can afford no room for failure or with security concerns may resort to the most field-tested technologies until future advances lower potential risks. And whilst eventually some of the concerns described will be solved, it still raises the question: whose responsibility is it to ensure conference attendees can effectively participate in any given multilingual meeting given that they may have traveled from across the world and may have paid substantial fees to attend? The conference organizers’ or the attendees’? Remote interpreting, whilst not a new idea, is increasingly becoming a feasible option of delivering interpretation services, due to more reliable high-speed internet and improvements in web and phone conference applications. In broad terms, remote interpreting refers to a method in which the interpreter is not physically in the same location as the conversants. There are various scenarios. The first scenario is to use video remote interpreting (VRI) where interpreters work from a remote facility using dedicated videoconferencing solutions. VRI is a growing field and particularly useful for briefs interactions in hospitals, schools or businesses located in areas not adequately served by onsite interpreters. Courts have also been using VRI for some time in situations where an interpreter is not immediately available and the case at hand is time-sensitive. VRI equipment manufacturers are now making it easier than ever to access these on-demand services; you simply download software on a computer or applications on mobile devices. Travel costs-savings, accessibility and reduced logistics planning are the main benefits of this method. Challenges reportedly associated with this method are audio and video feed disruption, delay or unsynchronized transmission due to poor Wi-Fi connection and other quality issues. Also, interpreters rely on visual cues and body language to understand the messages speakers are conveying, but in remote interpretation the video feed provided is often limited; thus VRI is also not a viable replacement for onsite interpreting in situations involving high interactivity. Further, onsite technical support staff should be available for setup and troubleshooting the equipment at both ends. More often than not, there is no onsite technician and interpreters are burdened having to manage the technology instead of focusing on the interpretation itself. Another layer of difficulty is when interpreters work in teams yet they are neither located at the meeting venue nor working in the same location as each other. In conventional settings, they are able to coordinate face-to-face aspects such as volume, turn-taking, terminology, meeting materials and so on between them. Chatting applications may be used to communicate such aspects if they are located in separate locations, yet it might not be as efficient as communicating live and again it adds pressure on the interpreter who is attempting to focus on interpreting. A second scenario that is increasingly common in conference settings is to resort to remote interpretation set-ups when space limitations make it difficult to accommodate all required languages and interpreter booths in the meeting room. Interpreters are physically present at the event site and their working units are connected to the same interpretation system being used in the conference room, but they will be located in another room and rely on good quality video transmission and display screens to receive visuals of the room and speakers. With all systems sitting on a network, international organizations are increasingly planning to unable remote interpreting in their permanent facilities, to assign interpretation booths location in one room to a meeting in another room. This process called booth borrowing gives facility managers plenty of flexibility to overcome physical spaces limitations and handle large events or last minute changes in language requirements. Another remote interpreting scenario which is gaining ground is that of virtual multilingual meetings. In this case, interpreters and/or participants are offsite and join the meeting remotely from different locations. Numerous systems have been developed to support multilingual remote participation with either a telephone or web conferencing service enabling the parties to connect from anywhere with a mobile app, tablet, computer or video device without any additional hardware to an off-site interpreter at a call center or home office. Participants can connect to the conference service and simply select the language of choice, allowing delegates to participate in their own language. Unlike generic video calling applications, specific video remote interpreting software accessed through an online portal or application can offer a more seamless process and increased security. Advances and integrated solutions are continuously being developed and optimized to solve in particular issues with audio quality and process inefficiencies. The future will undoubtedly bring further improvements to remote interpreting platforms as well as more comfortable working conditions for remote interpreters. Currently, high-stake meetings would still favor onsite interpreting with robust technology and proven track record of reliability and quality delivery until further advancements and research findings. Machine Interpreting: Is Siri The Next Conference Interpreter? Machine interpretation, also known as automated interpreting, is a relatively new concept which combines two existing technologies: machine translation and voice recognition software. Machine Translation (MT), a process by which automated computer software translates text from one language to another, has evolved immensely since its early days back in the 1940s with different approaches such as statistical, rules-based, syntax and hybrid techniques. The by-product of this technology is machine interpreting which converts spoken words into different languages by first capturing voice, converting it into text to then run it through the machine translation system and formulating it back through an electronic voice in the target language. Automated telephone interpreting and mobile applications which you talk into and turn words into a foreign language, either in text or as an electronic voice, already exist. Yet to consider interpretation as simultaneous, the technology would need to be able to predict and interpret sentences before they finish, a task notoriously challenging in languages which place the verb at the end of the sentence. In preparation of the 2020 Olympics in Tokyo and the anticipated language barriers, researchers from Nara Institute of Science and Technology have been developing software to improve the accuracy and speed of machine interpretation to such a degree as to be able to provide conference interpreting. A challenging undertaking with many obstacles to overcome as it is combining a number of immature technologies in addition to the fact that writing and speaking are inherently different. Despite some leaps forward in MT technology, it still remains hit and miss as far as producing accurate translations. Most people have experienced how frustrating voice recognition can be, it is unforgiving with heavy accents or regional dialects, background noises and any slight mispronunciation. In addition, speaking is more spontaneous than writing, with unpredictable rhythms, and machines still lack human judgment, intuition and cultural awareness to provide a satisfactory rendition of speech. It is fair to say that it will be some time before automated interpreting becomes a viable solution as a reliable interpretation tool, yet definitively a technology to look out for in the coming years. Technology advances in conference interpreting such as those discussed in this article, have spawned much speculation regarding the future of the industry and the changing environment which the profession is undergoing. Technologies and expectations are clearly evolving, offering both challenges and opportunities to language businesses. The response should never be to stand in the way of technology as it will prove to be a futile exercise. A better approach is to understand the benefits and be aware of the risks of each option and with that, determine the best solution that fits each need. There is no one-size-fits-all solution, customers have different needs, budgets, quality expectations, technical set-ups and the onus is on the industry to listen and provide the expertise in this niche market to meet the clients’ diverse demands. Buyers of conference interpretation technology require providers that continue to prioritize customizable solutions, innovation and scalability in their service offerings. With the increased complexity of the solutions available and the fast pace at which technical advances are taking place, the key to language service providers’ success is to stay one step ahead of the game. Leading providers who are technically savvy and adopt technology solutions when the time is right whilst balancing risks and benefits, gain a competitive advantage as a result. The difference might not only be in whether or not the business thrives in the changing environment, but it might hold the key to its very existence. As Charles Darwin put it: “It is not the strongest of the species that survives, nor the most intelligent, but the one most responsive to change”. About the author: Emma Mas-Jones is senior account manager at Conference Rental, provider of conference solutions for multilingual events. She has led language services programs at high-profile international organizations and events worldwide, including numerous Olympic events and world congresses.